Kim Jong-nam, the half-brother of North Korean leader Kim Jong-un, has been killed in Malaysia, local police say. 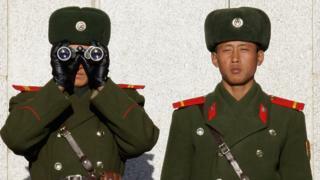 Some South Korean media have reported North Korean agents are responsible. No evidence has yet been provided. But since Kim Jong-un took power he has had no compunction in executing officials perceived as a threat to his authority - in the most high-profile case, his uncle and senior mentor Chang Song-thaek. And North Korea has a long history of sending agents overseas to carry out assassinations, attacks and kidnappings. A team of 31 elite, handpicked North Korean commandos were sent to the South with a simple mission: infiltrate the Blue House (South Korea's presidential residence) and assassinate President Park Chung-hee. While hiding out in the mountains above Seoul they were discovered by a group of civilians but decided that instead of killing them they would teach them about communism and release them with a warning not to tell anyone. Police and the military were notified, but the North Korean assassins managed to evade detection. They entered the capital, donned South Korean army uniforms and marched to the Blue House disguised as the very soldiers that were looking for them. At a checkpoint 100m away from the presidential residence, they were questioned and a gunfight erupted. Many of the commandos managed to flee but most were later killed or committed suicide as they tried to get back to the North. One was captured. More than 90 South Koreans in total were killed, including a large group of civilians who were reportedly on a bus. Assassination attempts in third countries, if this is indeed what happened in Malaysia, are nothing new. A bomb hidden at the Martyrs' Mausoleum in Rangoon, the capital of Myanmar (then Burma), exploded minutes before then South Korean President Chun Doo-hwan arrived to lay a wreath on 9 October. Seventeen South Korean officials, including four ministers, were killed. Four Burmese nationals also died. Mr Chun's car was delayed in traffic, saving his life. Image caption Myanmar cut diplomatic ties with North Korea in 1983 but resumed them in 2007. Three North Korean agents were involved and are said to have detonated one of three bombs early after hearing the sound of a bugle that mistakenly signalled the president's arrival. They fled the scene but one was later killed and two captured. North Korea has admitted kidnapping Japanese citizens in the 1970s and 1980s to train its spies in Japanese customs and language. Some were snatched from coastal areas in Japan by North Korean agents and others from overseas. The youngest was a 13-year-old girl abducted on her way home from school in 1977. Pyongyang has returned five of the abductees and says eight more died. Japan does not believe they are dead and says far more people were abducted. South Koreans have also been abducted too - the most high profile case was of a film director and his actress wife, who were snatched in Hong Kong and taken to North Korea so they could help build its film industry. There are estimated to be thousands of North Koreans living in Russia and South Korean consular official Choi Duk Keun's job was to monitor those of them in Vladivostok. He was found bludgeoned in October 1996 and South Korean media reports said he was killed to avenge the deaths of 22 North Korean commandos whose submarine ran aground on a South Korean beach a month earlier. North Korean defections have also led to assassination attempts. Last year, when North Korea's deputy ambassador to the UK defected, South Korea warned of possible revenge assassinations and kidnappings. There is precedent. When Hwang Jang-yop, a senior politician, defected to South Korea in 1997, another prominent defector, Yi Han-yong, was shot in the head by suspected North Korean assassins. He was the nephew of Song Hye-rim, who is Kim Jong-nam's mother. Thirteen years later, two North Korean military officials posing as defectors were jailed in South Korea for an unsuccessful plot to kill Mr Hwang.